Change is a fact of life in today's unpredictable economic climate, and The Right Movers understands the significant disruption that moving can have on a business. The Right Movers are experienced at helping companies relocate whether it be small or large. These moves can range from as small as the 500 sqft office suite to the multi-office industrial sized move. Our focus is to offer our clients the services necessary to minimize company downtime. As a full service moving company we offer weekend and after-hour moves to accommodate your demanding schedules. In short, we'll do whatever it takes to make your move a success. Our crews consist of trained professionals committed to safely relocating your furniture and equipment to your new surroundings. We have a fleet of both large and medium sized boxed trucks. Primarily, trucks with lift gates, which are key in delivering heavy commercial furniture, highlight our commercial moving service packages. Dollies, furniture blankets, tools for disassembling and assembling cubicles and desks, protective equipment (shrink wrap), and moving boxes are all available for your commercial moves. With moving boxes, please allow a minimum of a 72 hour notice for us to provide such. No two moves are alike and each move poses its own unique challenges. We'll collaborate with you to develop a move plan that fits the needs of your business and employees. When you're moving your business, downtime means lost revenue so The Right Movers offers flexible moving services to accommodate your businesses and employees' needs. The process begins with careful planning where we take into account all that you are moving, the two locations involved in the relocation, and come up with the best solution possible. We will place priority on your most valuable income-generating items. For instances, some businesses may require a prioritizing of glass showcases. Our duties will be to protect them as best as possible and provide for a smooth transferring of said items from one location to the next. Commercial/Office moves may require a checklist of insurance requirements from the building a business is moving in or out of. If this is the case, please do not hesitate to email the requirements to therightmoversofhouston@gmail.com as soon as possible. You can obtain this list from the respective building manager. 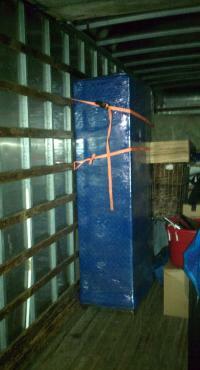 The Right Movers are bonded and insured at a level that meets most building requirements. If there are any exceptions, we will work with our insurance company to meet those requirements well in advance of the move. In some cases, depending on items moved and/or structure of office facilities, a deposit on may be required before the start of services. Not every commercial property requires or demands insurance documentation or requirements. For instance, commercial properties located in business shopping strips are known not to demand such. Our basic moving insurance is still in effect with every move we perform. Teams as small as 2 or as big as 8 are available depending on the size of the move. In most cases, buildings require General Liability insurance with a minimum of $1,000,000 in coverage. Different specifications are noted in each requirement checklist. At The Right Movers, our goal is to provide moving services to as many businesses in the Greater Houston Area as possible. We also look forward to establishing long-term relationships with many of you. Join the growing list of area commercial properties we are in partnership with by submitting your insurance requirements to therightmoversofhouston@gmail.com. We will send you a copy of our General Liability in hopes that we not only meet your requirements but are approved, filed, and listed as a preferred mover for your building’s future moves.